Let me describe a true event: The year was 1960, the place was Brooklyn, part of New York City, and in a housing project a six year old boy looked up at an eight story apartment building. All eight living rooms are stacked one above another, and in the early winter twilight, each window displayed the same thing: the twinkling lights of a Jewish Hanukkah Menorah. It was the eighth and final night of Hanukkah, all eight lights, plus the servant light, glowed brightly. Looking around, the boy saw an even more remarkable sight. For it was in those other buildings surrounding him that he saw a total of 23 apartment buildings sitting on a single plot of land. The vast majority of all these other living rooms also had Hanukkah Menorahs burning brightly. It was easy for the boy to imagine, as he did, that most of the world was Jewish! During those years, the housing project where I grew up, home to over 1,600 families, was about 90 percent Jewish. When December came, we celebrated Hanukkah. For eight nights we celebrated Hanukkah. We participated in all the warm rituals of the holiday. We lit the candles on the Hanukkah Menorah, we spun the “Dreidel”, (the spinning toy with Hebrew letters on each side), and depending upon which letter was on top, we either won or lost. Oh yes, and we ate! We ate the traditional Potato Latkes, a type of pancake, and ate them with either sour cream or apple sauce. In the Synagogue across the street, they had a special Hanukkah service for kids, and at the end, your reward was even more Potato Latkes, so I made sure not to miss it! Our traditions were those of the European Jewish community, and since all four of my grandparents were from Jewish communities in eastern Europe, that is the tradition we kept. Oh, I almost forgot ... on the first night of Hanukkah we also received gifts, sometimes presents, but more often something called “Hanukkah Gelt”, gold foil-wrapped chocolate shaped to look like coins; a reminder of times in Europe when real coins were given on the first night of Hanukkah. Not too long after this, I became aware that Jews were not the majority in the world. While my public school was mostly Jewish, there were a fair number of Catholics as well. And once December rolled around, these Catholics would eagerly ask fellow Jewish kids, “How are you going to celebrate your Jewish Christmas?" We indignantly responded that we don’t celebrate Christmas. We were happy with Hanukkah. And so, as children often do, the Catholic kids pointed out, in a teasing way, that their holiday displays had more lights. For they had a Christmas Tree and we didn’t, and Santa brought them many presents. Left out of all these cultural disputes was a poignant and ironic truth: The Jesus of Christmas actually celebrated Hanukkah! Fast forward some years. Now in my early 20’s, I came to saving faith in Jesus as my Messiah. I did not come to believe in Him as a way to escape being Jewish, nor to assimilate, nor as a reason to put up a Christmas tree. Rather, as I recognized that the Jewish Bible promised a Jewish Messiah to the Jewish people, it was clear that Yeshua of Nazareth, the one the western world calls Jesus, is the only one who matched the prophecies found in the Hebrew Scriptures. As a believer, I now wanted to understand what the Jewish holidays truly meant, and I found that many believers from non-Jewish backgrounds had a new-found interest in the Jewish roots of their Christian faith as well. known in Christian circles as the “ 400 silent years”, that time between the close of the Old Testament and the start of the New Testament. In reality, those years were not silent, but rather momentous, and were foretold in the Book of Daniel. The background is simple: After returning to the land from the Babylonian captivity, the spiritual state of our Jewish people declined. When Greek Hellenism was introduced to Israel as a result of Alexander the Great's occupation of the Holy Land, aspects of Greek culture were attractive to some Jewish people. Some Jewish families ceased to circumcise their sons and abandoned the food regulations of the Mosaic Law. Others went further and placed Greek idols in their homes. These serious compromises and assimilations weakened the Jewish people to the point where the Syrian Hellenists, heirs of Alexander the Great, made a bold demand of the remaining Jews - give up the worship of the God of the Scriptures, and fully adopt Greek paganism ... OR, be killed. The Maccabees, sons of the Jewish Priest Mattathias, led the Jewish people in a hard-fought revolt against the Syrians. They finally entered the Temple which had been defiled by the Syrian invaders, cleansed it and dedicated it anew to the service of God. Then, in memory of their victory, the Maccabees celebrated the first Hanukkah. Jewish tradition relates how the Judean heroes, led by Judah Maccabee, wanted to rededicate the Temple but were unable to find enough undefiled oil to light the 7 branched Menorah (lampstand) that stood in the "Holy Place" of the Temple; however, in one of the Temple rooms, they finally found a small jar of oil which was enough for just one evening. Miraculously, this small amount of oil kept the Temple lights burning, (not for one night, but for all eight nights) until new oil for use in the Temple could be made. This is the miracle remembered by the kindling of the Hanukkah lights according to Jewish tradition. Other Jewish sources point out that the older, and probably more accurate reason for the 8 nights of celebration is the effort by the Maccabees to make up for the missed 8-day celebration of the Feast of Tabernacles, which they were unable to observe in Jerusalem due to the Syrian occupation. Today, the most important observance associated with Hanukkah is the kindling of the Hanukkah lights on the Hanukkah Menorah, the nine-branch lampstand used for this Holiday only. On each night, one more light is kindled, beginning with one candle on the first night of Hanukkah and ending with eight on the final evening. The lighting is accompanied by the chanting of the traditional blessings, and the singing of songs. 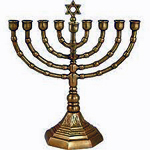 The ninth branch is the shamash (the servant light) which is lit first and used to kindle the other lights of the Menorah each evening. Messiah Yeshua observed Hanukkah throughout His life and is seen in the New Testament traveling to be in Jerusalem during this Holiday (John 10:22). Did you catch the irony in that? The one biblical mention of the Jewish holiday of Hanukkah is in the New Testament as it is being observed by Jesus, both of which are rejected by the majority of Jews. On that occasion in Jerusalem, Yeshua made a clear claim to be the Messiah, v.23-25. 1) Even when times are difficult for our Jewish people, God always keeps His Covenant promises to us (Gen 12:1-3) by sending us a prophet, leader or hero to guide us back to God's truth, helping us triumph over our enemies. While the Maccabees were used by God, the greatest example of this is the arrival of Messiah Yeshua, who provided a permanent atonement and a way back to the God of Abraham, Isaac and Jacob. 2) Accommodation with the sin and neo-paganism of our world is just as toxic to believers today as it was to the Jews of the Maccabean era. 3) The goal of the pagan Hellenists was to destroy the Jewish people as a nation. If they had been successful, there would have been no Tribe of Judah, no virgin Mary, and no Jesus! Without Hanukkah, there would be no Christmas. a. They tried to kill us. Those holidays are Passover, as we celebrate the victory of Pharaoh and his armies, Purim, which remembers the triumph of the Jews of Persia when Haman had conspired to have them all killed, and our consideration of Hanukkah. All three celebrations are accompanied by specific foods. Whether you spell it Hanukkah, Chanukah, or any other variation, the message is the same. As believers, we know our effectiveness for Yeshua is compromised by entanglement with today's equivalent of paganism. We should be modern day Maccabees, having sole devotion to the God of Israel and His Kingdom.